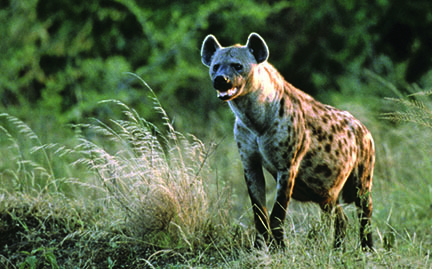 Known as scavengers that feed off leftovers, hyenas are also skillful hunters. They work mostly in groups, using their powerful jaws and sharp teeth to take down prey many times their own size. They have good hearing and keen eyesight, helping them hunt at night. Hyenas make a variety of vocalizations, one of which sounds like laughing.